I have gotten several requests for a copy of my column on Charlie Mayhood as it appeared in The Record. I also happen to like the headline better, and you get a better feel for Chris Archer's great illustration. The John Fell House Tea Room is pleased to announce a three-course tea in honor of our most-famous hometown patriot on Tuesday, Sept. 10, from noon to 2:30 p.m. at the historic John Fell House, 475 Franklin Turnpike, Allendale. The tea featuring a three-course luncheon by Passport Cafe of West Milford. $45 per person. Space is limited so please reserve your place by emailing Linda A. Schropp -- lschropp@optonline.net -- or calling Theresa Salameno at (201) 825-2840. Your non-refundable check is your confirmation. RSVP by Sept. 2 by sending your check payable to “Concerned Citizens of Allendale” to Theresa Salameno, 200 East Allendale Ave., Allendale, NJ 07401. Please include number of guests and their names with payment. Fyke Nature Association's next free guided walk at the Celery Farm is 8 a.m. on Saturday, Sept. 7. Marsh Warden Mike Limatola will be leading the group. Details follow. 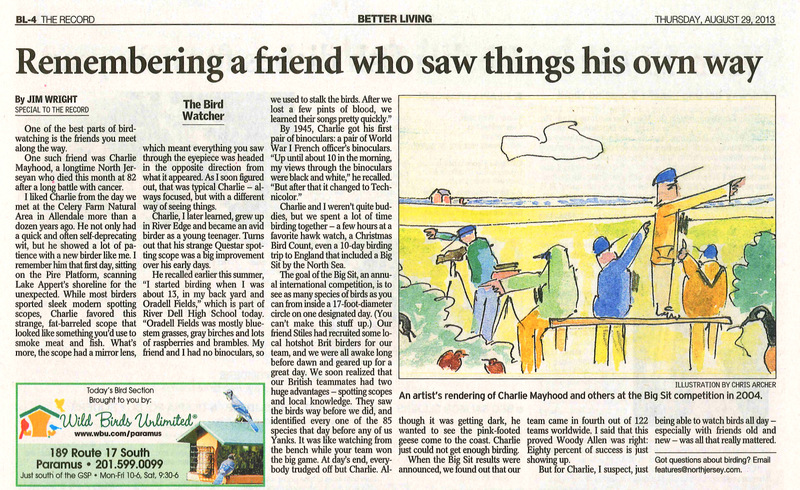 My latest "Bird Watcher" column for The Record and Herald News is a remembrance of our friend Charlie Mayhood, who died earlier this month. The calendars should be here soon! All proceeds go to the Stiles and Lillian Thomas Scholarship fund. The calendars make great holiday gifts for family and friends! Thank you to everyone who submitted photos. Those whose photos are in the calendar have been notified via separate e-mail. We had many good photos and the decisions were difficult. If your photo was not chosen that does not mean it was not good. Some of the photos were too similar to those used in previous calendars, were cropped too much and/or did not work with the Lulu software. The Stiles and Lillian Thomas Scholarship was initiated to honor Stiles and Lillian Thomas for their life-long commitment to preservation and conservation. This annual scholarship is awarded to a graduating senior student of Northern Highlands Regional High School who is pursuing a college degree in the environmental sciences, and who has demonstrate a commitment to the environment through participation in related community and school activities such as recycling, clean up, and green-conscious projects.